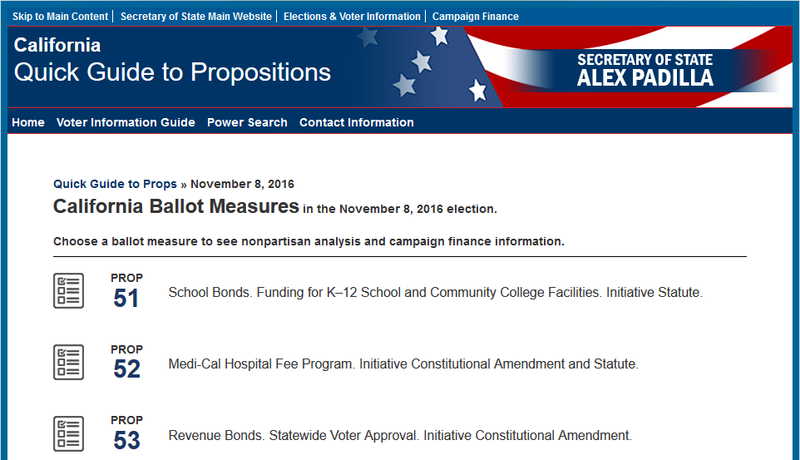 This fall, MapLight continued our collaboration with the California Secretary of State to launch the Quick Guide to Propositions, a user-friendly tool to help voters follow the money behind each of the 17 measures on the 2016 ballot. The Quick Guide makes it easy to find key information such as contribution totals and the top 10 contributions to “Yes” and “No” campaigns, alongside summaries and arguments for and against each measure. Funding data was pulled from Power Search—a campaign finance search engine that MapLight built in partnership with the Secretary of State—and updated daily through Election Day. As with Power Search, we designed the Quick Guide as open-source software so that other organizations can adapt our code to their transparency needs. The Quick Guide is now live on the Secretary of State’s website and available through the official Vote California app. The launch of the Quick Guide was highlighted in media outlets across the state, including Capital Public Radio, the Topanga Messenger, the Daily Republic, the North Coast Journal, and others. The guide was also promoted by civic organizations such as the California Voter Foundation, the League of Women Voters Berkeley Albany Emeryville, the San Benito County Registrar of Voters, and the Modesto Junior College Library.